Along with “reliable”, “spacious” and “fuel-efficient”, some also have critiqued that the Camry’s style is a bit “vanilla,” which is why Toyota decided to revamp the Camry to be a chocolate. They wanted the Camry to have the whole package, looks included. Last week Toyota showcased the updated Camry to the media, showing off its aggressive style and tech savvy look. Drivers can enjoy new tech features like a larger video screen, more smartphone based apps and a wireless cellphone charging system. By industry estimates, Toyota has spent around $200 million to revamp the sedan. Nowadays, with so much competition, the Camry can’t afford to be less attractive. Style is imperative. The front bumper has been completely revised and features a wider grille shape, the exterior is more expressive and dare we say, even has a more passionate look to it? You can also choose out of 10 colors like Ruby Flare Pearl (red) or Celestial Silver Metallic. 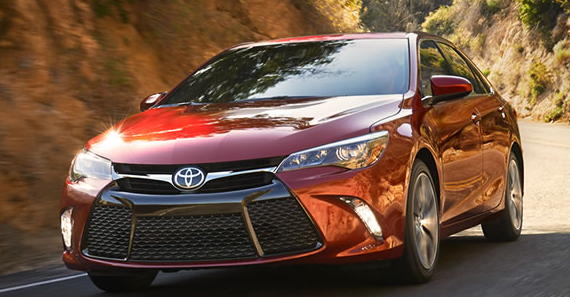 The new 2015 Toyota Camry is the total package now. If you are a car enthusiast who is very big on style, there is nothing left for you to complain about with this new model. Toyota has listened to your concerns and revamped the Camry to be better than ever. Aside from a newly styled exterior, there are also interior features that you can be proud of as well, such as premium materials, roomier feel and improved amenities. The center console has been redesigned and now offers a convenient power source in the storage box. You and your family are going to love the new Camry. Due to Toyota engineers work on improving the window and door seals to keep the noise outside, the end result is the quietest and most peaceful Camry ever. You can rest assured that your kids will be safe, as the new Camry includes safety-focused driver aids like Lane Departure Alert, Adaptive Cruise Control, Pre-Collision System with Auto High Beams. Feel the difference of the new Camry today by scheduling your test drive at our Toyota Los Angeles dealership. Our friendly staff will be happy to answer any questions you have! What are you most excited about for the 2015 Camry?